Most people think of Des Moines as one of those cities they fly over or drive through on their way to a more interesting destination. But there’s a lot more to this Midwestern town than corn fields. 1. Your Facebook "likes" live just outside the city. In 2014, Facebook set up shop in Altoona, a suburb of Des Moines. The $300 million, 476,000-square-foot building houses servers and hard drives and is the third Facebook data center in the U.S. A second building is planned. Mark Zuckerberg isn’t the only company leader who sees potential in Des Moines—Microsoft is building data centers worth $2 billion in West Des Moines. 2. On January 20, 1982, a 17-year-old metal fan named Mark Neal threw a bat onstage at a Black Sabbath concert. Thinking it was fake, Ozzy Osbourne picked up the bat and chomped down—which is when he realized it was the real deal. He went to the hospital for rabies shots immediately after the show. 3. What does “Des Moines” actually mean? There are two common theories. One is that “Moines” refers to the Trappist monks (Moines de la Trappe) who once lived at the mouth of the Des Moines River. 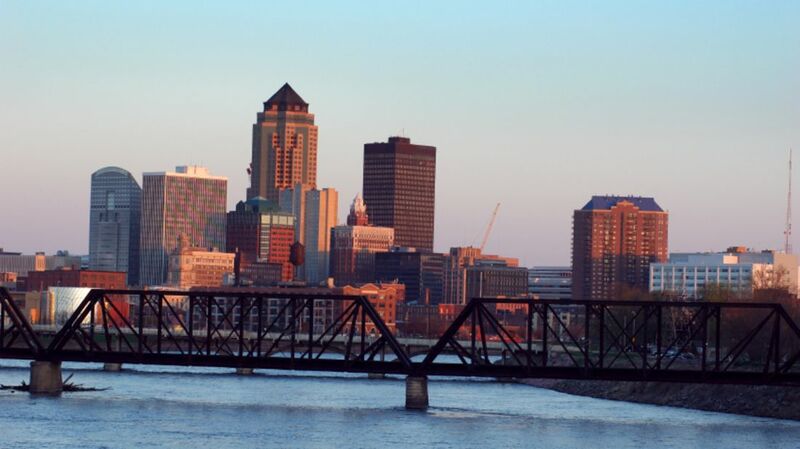 The other is that “Moines” is derived from “Moingoana,” a native tribe that also once lived along the river banks. Michael McCafferty, a scholar who specializes in Algonquian languages, says the name “Moingoana” is actually a little inside joke. In 1673, when Father Jacques Marquette asked the chief of the Peoria tribe what other tribes were in the area, the chief, not wanting Marquette to trade elsewhere, told him “mooyiinkweena” or “Moingoana.” That translates to “excrement-faces.” The joke was apparently lost on Marquette. 4. People have occupied the greater Des Moines area for at least 7000 years, drawn to the nearby river. In 2011, archaeologists uncovered a massive site they dubbed "The Palace," which housed more than 6000 artifacts dating back to that time period. 5. Pinterest’s founder, Ben Silbermann, was born and raised in Des Moines. Though he lives in California now, Silbermann continues to promote STEM causes around Iowa. 6. In 1933, Ronald Reagan accepted a job as the chief sports announcer for WHO in Des Moines. He was a very colorful announcer, and when he interviewed singer Joy Hodges a few years later, she suggested that he call her agent. RKO Studio screen tested Reagan immediately, and after just two days back in Des Moines, he received a telegram offering him a seven-year film contract. 7. We're counting the suburbs, but here are a handful of celebs who hail from the area: actors Brandon Routh, Jason Momoa, and Cloris Leachman; musicians T-Boz Watkins (TLC) and most of the band Slipknot; author Bill Bryson; and athletes Lolo Jones and Shawn Johnson. Masters champ Zach Johnson went to school at Drake University in Des Moines, but was born and raised in Cedar Rapids, Iowa. 8. Speaking of world-class athletes, Chow’s Gymnastics and Dance Institute is located in West Des Moines. Because coach Liang Chow has two Olympic gold medalists under his belt—Shawn Johnson and Gabby Douglas—other hopefuls are moving to Des Moines in droves just to train with him. He currently has three international elite gymnasts on his roster. 9. At 80 feet in diameter, the golden dome in Des Moines is one of the largest in the world. It cost $3500 to gild the dome back in 1905, but a 1999 restoration cost a little bit more: $400,000. 10. Iowa City was the capital of Iowa until 1855. When the state decided to move government operations to a more centralized location in Des Moines, the University of Iowa took possession of what is now called the Old Capitol Building. 11. More than a million people flock to Des Moines every August to experience the Iowa State Fair (to put that in perspective, the entire population of Iowa is about 3 million), in part because of the deliciously caloric foods. Apple Pie on a Stick and Fried Peanut Butter and Jelly on a stick are new this year, but other skewered options include funnel cake sticks, chocolate-covered chunky bacon maple nougat on a stick, Caprese salad on a stick, deep fried brownies on a stick, hot bologna on a stick, and the ever-popular Fair Squares (giant Rice Krispie treats on a stick). 12. Another big draw for the Iowa State Fair: Its butter cow. Every year (dating back to 1911), the fair's dairy artist carves the 600-pound creation, along with a themed accompanying sculpture. (This year's paid homage to Monopoly in honor of the game's 80th anniversary.) The Iowa State Fair's butter cow is a must-see for presidential candidates passing through the swing state; this year, Hillary Clinton, Martin O'Malley, Lindsey Graham, and Carly Fiorina all stopped by to pay their respects. 13. Actor Rob Lowe was playing in a PGA Pro-Am celebrity golf tournament in West Des Moines when a golf ball he had just hit struck and killed a goldfinch, Iowa's state bird, in mid-flight. Actuaries actually calculated the odds of him going to Iowa and killing a goldfinch with a golf ball: 1 in 747 million. 15. With easy access to a variety of farmers and producers, it should come as no surprise that the Des Moines Farmers’ Market tops lots of “best of” lists. More than 20,000 people attend every Saturday morning from May through October, and the Des Moines Farmer’s Market is consistently ranked as one of the best in the nation. 17. Even if you’re not familiar with Claes Oldenburg, you’ve seen his work: Massive art installations of everyday objects like the Free Stamp in Cleveland, the Spoonbridge and Cherry in Minneapolis, or the Clothespin in Philadelphia. Des Moines is lucky to have two Oldenburg pieces: the Crusoe Umbrella and Plantoir. 18. Slightly less highbrow art can be found within city limits, too. Exhibit A: the Pondering Rabbit, a sculpture by artist Barry Flanagan meant to mimic Rodin's The Thinker. 19. If you’re a fan of Better Homes and Gardens, Family Circle, Parents, and other magazines published by Meredith, you’re supporting a Des Moines-based business. Edwin Thomas Meredith founded Meredith Corporation in 1902 with the publication of Successful Farming magazine, then started publishing Fruit, Garden and Home magazine in 1922. Fittingly, Claes Oldenburg’s Plantoir sculpture is located outside of Meredith’s headquarters in downtown Des Moines. The damage done to the farms in the river bottoms was immense. Some were stripped utterly of their fences; fields under cultivation were washed into ruts by the violence of the water; all hope of a crop for one season being destroyed, not only by what was carried away, but by the debris which was left by the subsiding of the river. It was almost impossible to estimate the losses. Roads were rendered impassable—bridges swept away—the mails stopped, and traveling by land to any distance utterly vetoed. Houses were carried away, mills damaged, timber floated off, and all manner of mischief done by the flood. 21. Likely named after the Raccoon River and not the animal itself, the town was renamed at the direction of General Winfield Scott. Even if it does mean “poopface,” Des Moines residents are likely thankful to be Des Moinesians and not Fort Raccoonsians. 22. When children trick-or-treat (on Beggar’s Night, not Halloween), many adults require them to tell a joke in exchange for candy. The tradition started in the late 1930s when Des Moines police received a record number of calls about vandalism on Halloween night. The director of recreation for the Des Moines Playground Commission started a campaign to encourage more constructive Halloween activities, and told residents that "eats should be given only if such a 'trick' as a song, a poem, a stunt or a musical number, either solo or in group participation, is presented." 70+ years later, the tradition still stands. 23. From 1942 up until 2009, it was illegal to dance between the hours of 2 a.m. and 6 a.m in Des Moines. But unlike other silly local laws, this one was actually enforced: According to a 2009 report by the Associated Press, citizens became aware of the ordinance after the Des Moines Social Club, seeking permission to host a late-night party at their facility, was told they weren't allowed. 24. Got a thirst for … brraaaaiiinnss? Zombie enthusiasts (and anyone with an appreciation for the offbeat) flock to Des Moines' Zombie Burger + Drink Lab, where patrons can choose from burgers with names like "East Village of the Damned" and "Dead Moines." 25. According to the Greater Des Moines Convention and Visitors Bureau, the Science Center of Iowa, located in downtown Des Moines, is home to the only “functional clear toilet in the Northern Hemisphere.” If anyone knows where the clear toilet in the Southern Hemisphere is, be sure to let us know.